Creating memorable experiences happens when you pair creativity and a talented team of professionals, whether it is for a social celebration or to elevate a corporate brand at a company’s event. Events are made to inspire, create and engage. And, today’s events must be even more creative, authentic, and experiential. Music helps – music that reflects authenticity, imagination and inspiration. Whether it is a cocktail or dinner reception to conclude a conference, a gala or an intimate reception, or a stage performance, live music will bring spark, energy, beauty and foster connectivity. LB Entertainment helps create entertainment designed to enhance many types of events. Our musical artists, LB’s multi-talented Mélange Jazz Collective and LB’s innovative and original live electronic act MïxT BeatZ bring delight to many audiences for many occasions. (Artist Closeup: http://www.lbentertainmentintl.com/2018/03/). Our musical options are tailored to individual needs. For information regarding booking your upcoming fall season’s events or to request additional information about our rates, artists and their availability, please call us today or write to danielle@lbentertainmentintl.com. Mélange Jazz Collective’s distinctive sound fuses various musical styles and backgrounds as varied as Jazz, blues, Latin, reggae, funk, new music, gospel, world. Music groups form for a variety of reasons – musical relationships, friendships and desire to perform together – but the group’s sound grows out of an understanding among the members about a collective’s musical direction and an acceptable musical outcome. Mélange’s cohesive sound reflects the collective’s close musical collaboration, history, group dynamics, improvisation. Each member expresses his individual voice and strives to engage the others to create a unified sound. Members of Mélange Jazz Collective are a group of passionate collaborators who have performed together for over 10 years and have collaborated on several music projects. Their unique sound and style is the result of a long creative journey together that keeps developing. “The joy of performing lies in the unexpected discovery of a new way of interpreting a tune, or in experiencing a spontaneous interaction between group members in the course of the performance that might take the tune in an unusual direction. Ultimately, a collective, informed and inspired improvisational experience might actually be considered even more successful if it leads into a kind of spontaneous musical arrangement, albeit one that is fleeting and unrepeatable. Progress might be measured by an ever-increasing number of these “arrangements” as we continue to perform together”. Steve Strawitz, Mélange Jazz Collective’s guitarist/violinist. A summer evening in the heart of our historic neighborhood – It’s always a great pleasure to perform in our own neighborhood! LB Entertainment is pleased to be invited at Betsy Ross House and have Mélange Jazz Collective perform in its beautiful courtyard for ‘The Little Rebel Garden series’ http://historicphiladelphia.org/betsy-ross-house/betsy-ross-upcoming-events/. Enjoy local craft beers and tasty treats from some of the city’s most popular food trucks to the sounds of Mélange Jazz Collective trio. Entrance to the Beer Garden is free, food and drink are pay-as-you-go; after-hour tours of the house are $5. Video: https://www.youtube.com/watch?v=wom06cNTpOI – Excerpt from ‘Saturday Morning Feeling’, one of Laurent’s original compositions performed by Mélange. Featuring LB on tenor saxophone, Bert Harris on upright bass, Robert Morales on conga drums. Join us for live performances by Mélange Jazz Collective interpreting the work of an eclectic array of composers and original compositions by members of the group. July 2, Sassafras, 48S 2d Street, Old City, Mélange Jazz Duo, Laurent Bass and Bert Harris, 6:30pm-9:30pm. July 9, Sassafras, Old City, Mélange Jazz Duo, Laurent Bass and Bert Harris, 6:30pm-9:30pm. 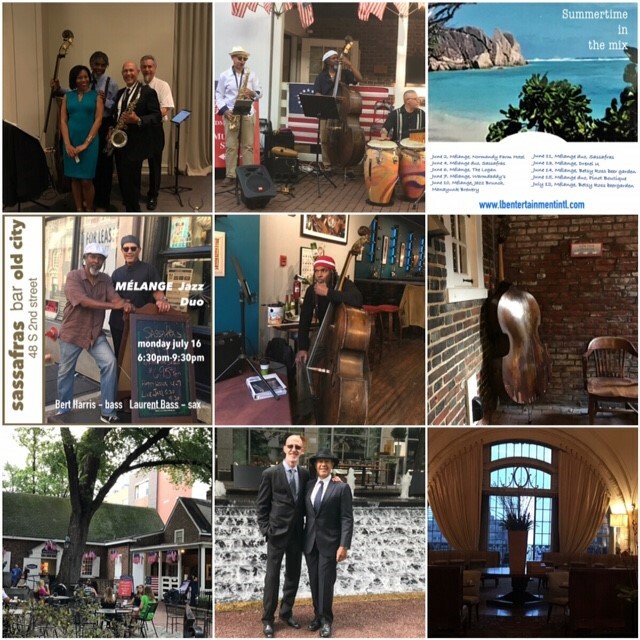 July 12, Mélange Jazz Collective Trio, Betsy Ross House, 239 Arch Street, Old City, 5:00pm- 8:00pm, Little Rebel Beer Garden series. July 16, Sassafras, Old City, Mélange Jazz Duo, Laurent Bass and Bert Harris, 6:30pm-9:30pm. August 2, Mélange Jazz Collective Trio featuring saxophonist Laurent Bass, bassist Bert Harris, guitarist Steve Strawitz. First Thursday of the Month, Warmdaddys’, Thursday Happy Hour hosted by Michael Tozzi and Ijazzglobal.com, 5:00pm-7:00pm. August 13, Sassafras, Old City, Mélange Jazz Duo, Laurent Bass and Bert Harris, 6:30pm-9:30pm. August 27, Sassafras, Old City, Mélange Jazz Duo, Laurent Bass and Bert Harris, 6:30pm-9:30pm. September 6, Mélange Jazz Collective Trio, First Thursday of the Month, Warmdaddys’, Thursday Happy Hour hosted by Michael Tozzi and Ijazzglobal.com, 1400 S. Columbus Blvd, Philadelphia, 5:00pm-7:00pm. September 10, Sassafras, Old City, Mélange Jazz Duo, Laurent Bass and Bert Harris, 6:30pm-9:30pm. September 14, Mélange Jazz Collective Trio, Betsy Ross House, with Laurent Bass on saxophone, Bert Harris on bass, Robert Morales on conga drums. 5:00pm- 8:00pm, Little Rebel Beer Garden series. September 16, Mélange Jazz Collective featuring saxophonist Laurent Bass, bassist Bert Harris, guitarist Steve Strawitz. Sunday Jazz Brunch, Manayunk Brewery Restaurant, 4120 Main Street, Manayunk, 10:30am– 2:30pm. September 17, Sassafras, Old City, Mélange Jazz Duo, Laurent Bass and Bert Harris, 6:30pm-9:30pm. September 20, Laurent Bass + MïxT BeatZ, private event, Blue Bell. September 21, Mélange Jazz Collective Trio, Bert Harris, upright bass; Laurent Bass, tenor saxophone; Robert Morales, conga drums. Wynnewoods Whole Foods Market, 6:30pm-8:30pm. September 22, Mélange Jazz Collective Quartet, featuring saxophonist Laurent Bass, bassist Bert Harris, keyboardist David Dzubinski, drummer Jeff Johnson. Wyndham Hotel & Resorts, M1111 Route 73, Mount Laurel, NJ 08054. September 27, Mélange Jazz Collective, with saxophonist Laurent Bass, keyboardist Walter Runge, bassist Bert Harris, ‘Cars & Cigars 2018′, private event, The Capital Grille, King of Prussia. October 5, Mélange Jazz Collective trio, private event, Old City. Thank you for your continued support of our music entertainment and local artists. Please check out our upcoming Fall Preview newsletter for some exciting musical news and a new season of events.